Whether you are at a work event, family gathering, or a cocktail party, we can often feel an intense pressure to be able to work the room. Take a minute to think about what kind of person comes to mind when you think of someone who is great at working the room at events. Most people may think of a person that may be charming, outgoing, extroverted, and a great conversationalist. The truth is, you don’t need to be outgoing and charismatic to be able to socialize well, you just have to be genuine and learn to have meaningful conversations with others. Engaging with strangers or acquaintances is difficult enough, but having meaningful conversations can tend to be a real challenge for many. 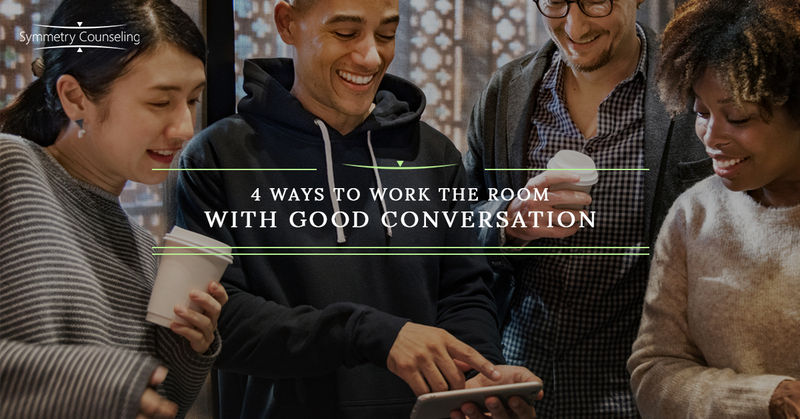 Below are 4 strategies you can use to have more meaningful conversations and connect rather than feeling uncomfortable and awkward. Many people get intimidated by social events as they “don’t know what to talk about” or “hate small talk”. Depending on the relationship you have with the person you are talking to, you can have different topics ready before attending the event. For example, if you are attending a party where you won’t know too many people, you might have some basic stories about your favorite sports team, the weather, local celebrities, etc. to discuss. If you are closer to the people at the event, you might consider some more intimate topics such as family, relationships, health, and work life. Thinking about some topics of conversation ahead of time makes the conversation flow more easily in the moment. We are often more concerned about being perceived as interesting to others rather than being genuinely interested in what they have to say. Asking open ended questions about the other person’s life, opinions, and experiences rather than talking about yourself leaves them feeling better about the conversation. Questions such as “how do you spend your time off?” or “What are some of your interests?” convey the message that you are genuinely interested in the conversation with them and keeps them interested as well. When we feel uncomfortable or even passionate about a topic, it can be easy to take over the conversation. Try to shy away from being that person that doesn’t let anyone else get a word in, interrupts, or talks over other people. Being a good conversationalist includes being a good active listener as well. Active listening includes making eye contact, engaging in appropriate facial expressions, asking clarifying or follow-up questions, and challenging yourself to not always speak what is on your mind. Taking a step back and allowing others equal speaking time will leave them feeling heard and respected after the event is over. There are just some conversations that are unbearable regardless of how hard you try. Lingering on a conversation that you are bored or uncomfortable with can be one of the most awkward things to do. If you are feeling this way while you are talking to someone, there are ways to exit gracefully. The best way to exit is to excuse yourself, thank them for their time and conversation, and then move on to another person or group. In extreme cases, you can excuse yourself to make/answer a phone call or use the restroom. It can feel uncomfortable interrupting a story or conversation, but if it is intolerable, then you can make your exit in a respectful manner. If you are currently struggling to engage in genuine, meaningful conversations and would like some support, it may be useful to connect with a therapist. Contact Symmetry Counseling at 312-578-9990 to set up an appointment with one of our very skilled therapists today!